Torque Vectoring by Braking helps plant your XE on twisty roads. On tight turns, it applies the brake to the inside wheel and directs engine torque to the wheel with the most grip. This immensely strong body saves weight without compromising durability and provides very high torsional rigidity. It is the ideal platform for a performance car and helps achieve optimum weight distribution approaching 50:50. The ZF® 8-speed automatic transmission in the XE offers quick and smooth gearshifts while automatically adapting to suit your driving style – relaxed or sporting. Enjoy the added control and exhilaration of manual gear selection at your fingertips with convenient paddles behind the steering wheel. 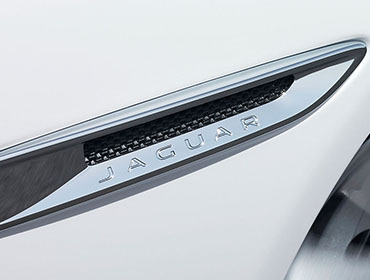 Chrome-framed, Jaguar embossed, mesh side vents emphasize a sporting character. 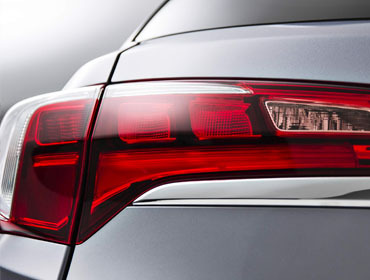 Taking design cues from the F-TYPE, iconic taillights feature a distinctive roundel intersected by a horizontal line. Our leather is sourced from the finest hide suppliers in the UK and Italy for a natural, glove-soft feel. Twin needle leather stitching not only enhances durability, but also offers contrasting colors that define the luxury interior. The XE is a surprisingly compact 183.9 inches long by 77.4 inches wide (excluding mirrors), yet it can carry five adults in complete comfort. And with 15.9 cubic feet of trunk space it can accommodate everyone's luggage too. The InControl Touch multimedia system is a hub for connectivity, control and entertainment. Its 8" touchscreen, with intuitive touch and swipe controls, provides you with full command over a wealth of features including audio, climate and satellite navigation. A high-definition 12." Interactive Driver Display features an entirely new graphical interface with advanced functionality to make driving even more of a pleasure. You can choose from four preset display themes, or full 3D Map View, to suit your personal preference. InControl Protect™ includes SOS Emergency Call, which can automatically bring the relevant services to your exact location in the event of a critical situation. It also provides Jaguar Optimized Assistance which transmits your location and vehicle diagnostic data to help minimize delays to your travel. The optional Surround Camera System available on the XE uses four cameras to provide multiple views around the vehicle. Optional Traffic Sign Recognition (TSR) technology uses a forward-facing camera to detect speed limit and no passing signs, and then it displays them to the driver on the instrument panel. If available and active, the Adaptive Speed Limiter uses the signage information, alongside map data from the optional navigation system, to help keep you under the appropriate speed limit. The XE Blind Spot Monitor (optional) uses radar sensors to cover areas difficult to see when you're driving – either directly or rapidly approaching in your blind spot. If it detects cars overtaking, it warns you via an amber icon in the appropriate door mirror. In addition to Blind Spot Monitor, available Blind Spot Assist can help prevent collisions. If your car detects another vehicle in your blind spot when you begin to change lanes, Blind Spot Assist provides a precisely calculated opposing steering torque - guiding the vehicle safely away from the approaching vehicle.